Inspiring the next generation of brass players at Floreat Wandsworth, Wimbledon Chase and High View Primary Schools. Helping Putney Methodist Church raise over £400 for the Glass Door Homeless Charity. Performing for three camels in Putney and a donkey in Balham; all in the space of two hours! Free mince pies and strudel from Morrison’s Wimbledon when playing outside in a very damp Christmas Market. And, of course, appearing not once, not twice, but FIVE times on ITV, launching their Christmas competition alongside Andi Peters, live on Good Morning Britain and Lorraine. 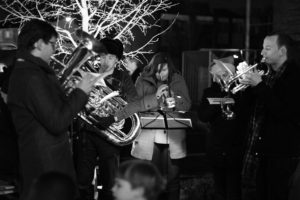 As a new project in the area, we’ve been humbled by the way local community has welcomed and engaged with us, and look forward to providing the soundtrack to many more events in South West London throughout 2018.